Burnley manager Sean Dyche was impressed by how his side executed his game plan against Brighton this evening. The Clarets, who started the game in the relegation zone despite being unbeaten in six league games, relieved some pressure with a 3-1 victory to move level on points with their opponents. Dyche said: "I am pleased with the mentality of the group. We've had some very good performances but today was a different kind of performance. 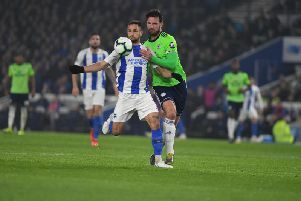 "I think they [Brighton] are a really good side. We felt they were going to have the ball and try to dominate the game. "We had to be resilient and do all the basic things well. We needed key players to play well and for us to take chances, and it did pan out just like that. "It was a very good performance from a manager's point of view. You need to defend resolutely, do the basics well and take your chances and I thought we did that today. "Every part of the season is the business end. Every win is important. It is so difficult in the Premier League." Burnley had Tom Heaton to thank for providing them a platform to go and win the game, with the English goalkeeper pulling off several outstanding saves to keep the hosts at bay. Dyche said: "Heats played well and he did the things he should do. He's a top keeper. I have got three keepers who are all top keepers in different ways. "There are things I expect from him and he delivered today." Dyche also reserved praise for former Brighton pair Chris Wood and Ashley Barnes who provided the goals. "I thought the front two were excellent," he said. "It's hard up there when you don't have as much of the ball. The service is indifferent sometimes because of the quality of the opponent, but they were on it and alert. They are in very good form at the moment and they have done it again today." On some of the controversial decisions made by the officials in the game, Dyche said: "I try to not get too involved in it. Referees have a really tough job. Over the season, it evens itself out."